Your cloud phone system on your mobile, desktop, and web browser. Your phone system should be as flexible and on-the-go as you are. 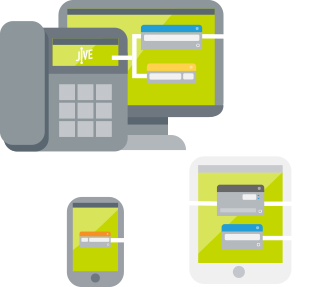 Access your Jive Voice features everywhere you need them with Jive Mobile. Jive Desktop, and Jive Web. Jive’s softphone app lets you take your business calls on your mobile device. ive’s software app lets you place calls and start chat sessions via your desktop. Jive’s online portal lets you make real-time changes and calls on your web browser.